If a herb can be described as humble, then parsley fits the bill. This underrated herb is usually part of every herb garden but is often only used as a garnish. To give parsley its due here are 10 ways to use it – in addition to its ability to pretty-up a dish. 1. Parsley is one of our richest sources of vitamin C and it also contains vitamin A and minerals such as iron. These all build the immune system and two tablespoons of parsley a day (chopped, infused or added to salad) provides strong protection against colds and flu. 2. It is a natural diuretic which helps the body cleanse itself and is an excellent herb to use when detoxing, especially at the end of winter when, our systems, as well as our houses, need a spring clean. Because it is a cleanser it can also help relieve problems such as gout, arthritis, rheumatism, which result from an acid build up. 3. If you have eaten garlic, quickly chew some stems and leaves of fresh parsley and it will freshen your breath. 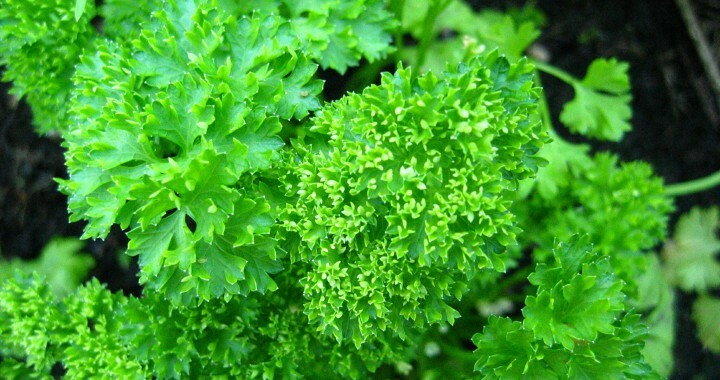 Chewing parsley also helps to keep gums healthy. 4. In traditional French cooking , 3 stalks of parsley, 1 bay leaf, and 1 sprig thyme are tied together to form a bouquet garni that is used to flavour a slow cooked dish. It is removed before serving. 5. When parsley is used with other herbs it tends to enhance the flavour of other herbs. Italian parsley is more robust than moss curled parsley and it can be added during cooking while the moss curled should only be added at the very end. 6. If you suffer from indigestion make a soothing cup of parsley tea. 7. As a beauty treatment use parsley as a skin cleanser, tonic and toner. 9. In the garden, parsley is a good indicator of soil nutrition. It quickly shows a deficiency of iron with yellow leaves. 10. It is a good companion plant for roses because it attracts the aphids away from the roses. In fact any other plant that is attacked by aphids will benefit being planted near parsley. In terms of nutrition, there is no difference between ‘Moss Curled’ (Petroselinum crispum) and ‘Italian Giant’ or flat leaf parsley (Petroselinum crispum var. Italian). However, Italian parsley is more able to withstand frost and it grows into a bigger plant, about 80cm high compared to garden parsley which rounder, more compact, and 30 to 60cm high. Many people prefer the taste of Italian parsley and it tends to be favoured by cooks because it can stand longer cooking. A third kind of parsley is Root Parsley (Petroselinum crispum subsp. Tuberosum). It is reputed to have a milder, sweeter taste than parsnip and the root look like white carrots. It is not easily available here but is in German cooking. Parsley grows best in full sun and likes deep, fertile soil that drains well. In other words, it likes the same growing conditions as roses, including regular watering, which is why they are such good companions. Although parsley is a biannual it is best to set out new plants every six months, especially if you harvest regularly because the plant tends to develop a stem, which reduces the yield. Strangely enough it is one of the more difficult herbs to grow from seed as germination is a lengthy process. Rather buy young parsley plants for a continuous supply. Parsley doesn’t dry well and tends to lose its taste. The best way to preserve parsley is to chop it up, put in a plastic bag and freeze it. Another preserving method is to make a ‘parsley pesto’ and freeze it in small quantities. Put chopped parsley, chopped garlic, chopped pine nuts or flaked almonds and olive oil into a blender or food processer and whizz it up. The texture can be quite rough or smoother, depending on your taste. Fresh parsley pesto, with parmesan cheese added, is delicious drizzled over roasted vegetables just before serving. Also delicious is Gremolata. This is a combination of lemon zest, garlic, parsley, salt, black pepper and olive oil. It can be used as a garnish on grilled or roasted lamb, pork chops, beef, and even roasted potatoes and broccoli. Gremolata is best made fresh and allowed to stand for an hour before using so that the flavours can develop. Posted in Culinary, Growing Herbs and tagged culinary, flavour, health benefits, herbs, parsley, tips, uses.